This underwater tray with video torch lights is made of aluminum, PC, ABS.The package box size about:37 cm(L) x 32 cm(W)x 6 cm(H)(14.6 inch x 12.6 inch x 2.4 inch);Package weight:1.6kg. The torch light has 4 levels of power consumption.High:2 hours with 900LM;Low:5 hours with 300LM;Strobe:7 hours with 450LM.When the light is ON,please DON’T look straight. Temperature Protection:When the temperature more than the internal temperature setting of the camera light, internal color circuit will automatically reduce the LED brightness, to insure that the torch work in the normal temperature. Comes with 2pcs torch lights,rechargeable battery,battery charger and two-handle tray arm.The two-handle tray arm is flexible,you can adjust it in any angel you want. 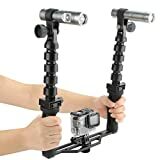 Compatible with ALL HERO 5,HERO 4, HERO3+, HERO3, HERO2, SJcam,Xiaoyi and other action camera,it also can be use for DSLR Cameras,4 inch and 6 inch SHOOT dome ports,and other camera accessories that with 1/4″ tripod screw hole. When the temperature more than the internal temperature setting of the camera light, internal color circuit will automatically reduce the LED brightness, to insure that the torch work in the normal temperature. When the red indicator light start flashing, the LED lamp brightness will automatically reduce to low light mode, to remind user will close in about 10 minutes. 1.All products sold by shootglobal are covered by 12 months warranty. 2.If you are not satisfied when you receive your item,or have any problem in using the product,please feel free to contact us,we will answer you within 24 hours. NOTICE:The camera and waterproof housing case show in the picture are not included. This entry was posted in Discount Photography and tagged 100M, 5/4/3+/3/2/1, 900LM, Accessories, Camera, Diving, Dome, Flash, Flexible, GoPro, Hole, inch, Light, Lights, Port, Screw, Shoot, Sjcam, Torch, Tray, Tripod, TwoHandle, Underwater, Xiaoyi by Ball Photo. Bookmark the permalink.